Launching the Nerissa website on November 11th brings back the memory of a very special "Remembrance Day" in 2002. Herb Coles is one of the Canadian Army survivors and all these years had been wanting to thank the man that pulled him to safety, saving his life. Herb knew that it was one of two men - Pvt. 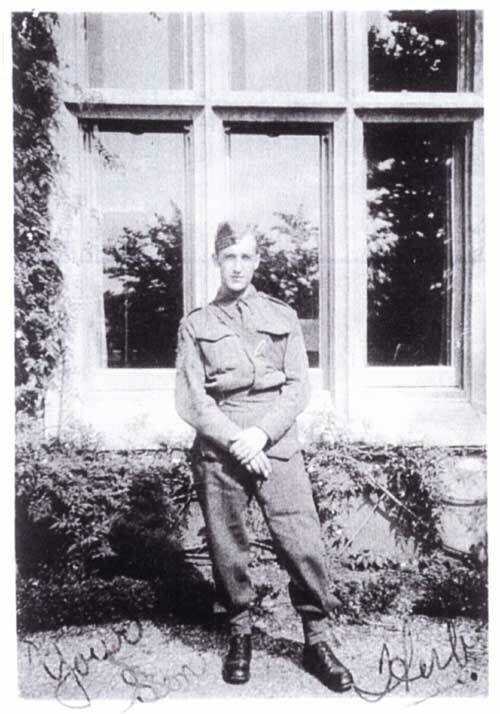 Raymond Victor Currie of the Canadian Provost Company or Sgt. Frank Stojak of the Corps of Military Staff Clerks. Herb wrote a letter to Frank and his reply was that he couldn't recall all the details of the experience. So we now had to find Raymond Victor Currie. CURRIE, Constable R.V. - 12502 Canadian Provost Company (RCMP). Survived sinking of SS Nerissa, WW II. Sought by COLES, Walter (Herb), whom he rescued. Ann Hentschel, Sarnia, Ontario. ann@ebtech.net. My father believes you are looking for the same R.V. Currie he knew well and worked with in Regina. R.V. 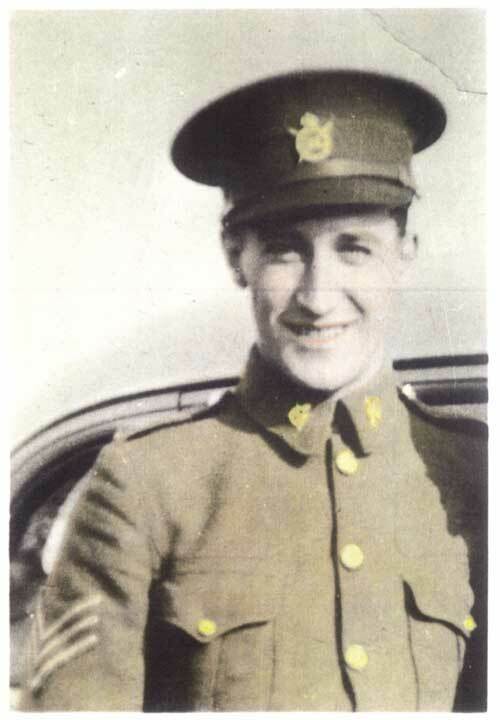 Currie went by Vic Currie and my dad recalls that Vic was with the Provost Company and then with the RCMP. My dad tells me that Vic Currie died a number of years ago but we believe his wife Marvel is still alive. When my father last spoke with her she was living in St. Albert, Alberta. Vic Currie is also survived by a son, Douglas Currie who was with the RCMP as well but my father believes Douglas left the RCMP a couple of years ago. He may also be living in Edmonton or the surrounding area. My dad doesn't know if you heard anything back but he wanted to send this along. If you think this is the right R.V. Currie, my dad would probably be prepared to make some phone calls to see if he can track down Marvel Currie or Douglas Currie. Hope your search is successful. Herb replied to Adrian right away confirming that it was indeed the same Raymond Victor Currie that he was searching for and thanked him for any assistance his father could give. I was happy to hear back from you so quickly and that we were talking about the same R.V. Currie. My dad was delighted as well and started making some phone calls. He found out that R.V. Currie's son Doug ( who my dad knows as well ) is still with the RCMP and working in St. Albert which is just outside Edmonton. He also found out that R.V. Currie's wife Marvel died a couple of years ago at the age of 90. This leaves only his son Doug surviving him as the other son Duncan is not alive. My dad hopes to speak with Doug Currie sometime this weekend and will pass along your email addresses with the request that Doug get in touch with you. I hope that you connect with Doug Currie on November 11. I have received all the emails that you and Ann have made between you and I am very pleased that everything has turned out as well as it has. As you probably know, it has been a long search to find R.V. Currie and it is all due to the dedication and willingness on her part to help in the search. When our boat was torpedoed about 200 miles off the coast of Ireland near Londonderry, the lifeboat to which I had been assigned was someway upended and all the people in it were dumped into the water. When I surfaced I swam away from the ship as it was going down and I did not want to get caught in the suction of the water. It was in total darkness so I swam until my arms hit a raft which had floated clear of the boat. There were many on the raft and around the side of it holding onto the ropes that went all around the raft. I put my arm through one of the loops and hung there until it was daylight ( I was not conscious all the time ) when I found that there were only three men left. Two were on the raft and myself in the water. One of the men grabbed my arm and pulled me so hard that I let go of the rope and he then got me sitting on the raft with my back to his ( I had hurt my back during the fall into the water). After quite some time a plane flew overhead and shortly two destroyers came along and while one circled around the area the other one picked up personnel from the rafts and lifeboats that were left. We were taken to the hospital in Londonderry and as the personnel got better we were shipped out to England. Since that time I always wondered where those two companions were and no way to find out. I think that a lot of information was not released until around 1982 and therefore no opportunity to contact any survivors. When the computer age came along the door was opened to do long-range communication and make inquiries ( that is if you owned or was able to get the use of a computer). My hope is that you could get in touch with Douglas Currie and tell him that I wish I had been able to personally thank his dad for saving my life. Although we did not meet after the incident on the raft, I will never forget the feeling I had when his hand took mine and helped me gain safety. I would like to have you give Douglas a copy of this letter, if you wish, and I would be happy to have his address or email address to communicate with him. Thank you very much Adrian for your help. Maybe you could get this to Douglas by Monday as that day is one special day for remembering the past and those who helped make it special. Well November 11 arrived and amazingly George Currie had made contact with Doug Currie in the past few days and arranged for Doug to contact Herb on Remembrance Day. I have just received your combined correspondence regarding your chance meeting with my father on the night of April 30, 1941. As you already know I am the only surviving member of R.V. Currie's family. I am pleased to hear from you and do hope this message makes its way to you on November 11th. I am familiar with the story as my dad would relate the events of the night in question on this date in years past ( it would only take a slight prodding, usually with a couple of scotches ). I remember in the more sombre moments of the tale he would talk about the men who were clinging to the raft and how everyone tried to help every other man as best they could. However the effects of the cold and injuries took their toll and most just quietly slipped away during the night. My father used to say he survived because of his survival pack which consisted mainly of a couple of bottles of rum. I don't know if this was true, but he always maintained it was and since I wasn't there it may have been just as he said. I would like to say that I remember his talking about your specific incident and maybe he did but I honestly don't remember. My impression was as stated before, everyone did whatever they could for each other and those who drew the long straws, so to speak, survived and those who didn't perished. I really don't think there's a lot more to it than that. Some were lucky and some weren't. Having said that, I do not mean to belittle in any way any actions that anyone took nor do I wish to diminish whatever feelings you may have towards the person who pulled you from the water on that tragic night. Those of us who have never experienced this sort of thing can possibly imagine the thoughts and feelings going through one's mind and body at the time and how an event of this kind can effect a person later in time. In closing I would again like to thank you all for taking the time to pursue this matter. If you require any further info please feel free to contact me via this marvel of the modern age and I will be happy to supply whatever ….. for old times sake. In September 2003 I had the privilege of meeting Herb and his wife Dorothy in Cambridge, Ontario. They are such a wonderful couple; it was as though we had known each other for years. Remembrance Day will always have special meaning to me thanks to Herb. Sgt. Walter (Herb) Coles. Click a photograph to view a larger version.